I just finished reading a post about an SEO strategy for WordPress called PageRank Sculpting. The post talked about how you wanted to add a “no follow” attribute to categories and tags in order to prevent giving away PageRank unnecessarily and drive more PR (PageRank) juice to the posts of your blog. I have to be honest with you here, the concept of preventing your tags and categories from being crawled, indexed, and thus generating PageRank (PR) from Google is ludicrous to me. Why in the world would any blogger using WordPress want to prevent the crawling and indexing of content pages from their blog. The more tags and categories that you have indexed, the more exposure you’ll get in Google search results. Let me give you an example from this blog of the benefit of allowing your categories and tags to be indexed. Below is an image of the keyword phrase “apple iphone 5”, which drives a fair amount of search traffic to my blog each day. Notice in this graph that the main pages of my site that are getting the most traffic for the keyword phrase “apple iphone 5” are tags – to be more specific the “iphone-iphone-5” tag and the “apple-iphone-5-images” tag. 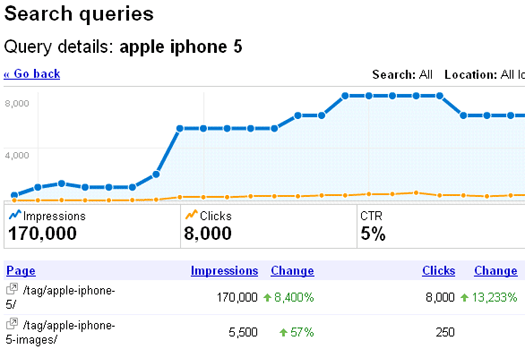 In fact, you’ll also notice that the tag “apple-iphone-5” has increased nearly 8500% in impressions and over 13,000% in clicks in Google. This is something that would have never happened in my blog if I had categories and tags blocked from Google crawlers. And then there’s the PageRank being delivered from this particular tag. 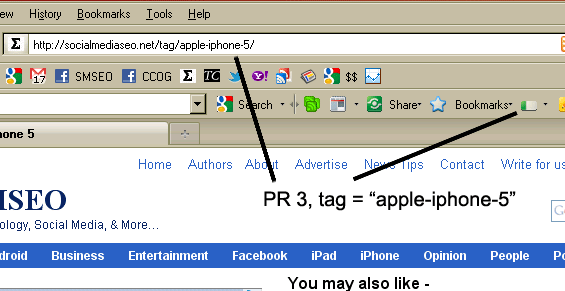 As you can see in the image below, this tag alone carries a PR3 which dramatically helps all of the unique articles within this tag to earn more PR and authority. And that’s just an example of one tag within my blog that is driving high levels of traffic. And this traffic is a result of the PageRank and exposure in Google’s search results. I think this is the easiest part for me to explain because you can verify that all 12 categories along the top of this blog carry at least a PR4. And the categories themselves, because they are found in Google’s search results, help contribute to the overall traffic coming to my site. The tags and categories within your blog, if you are building them strategically, will have a unique mix of your articles underneath them. And these articles make up the unique content found within each category and tag. This mix of articles, which are unique for each category and tag, allows Google to see unique content per category and tag. Each category and tag is a page within Google just like any one of your individual articles. This is true because each category and tag has it’s own unique URL. And Google will see each URL as an individual page that is available to receive PageRank and be ranked for search results for specific keyword phrases. Again, blocking Google from your categories and tags is something that makes absolutely no sense to me, and in fact, works directly against the whole premise of SEO – and that is, to get exposure in Google search results in order to increase traffic to your blog.